Global publisher of medical, nursing and allied health information resources in book, journal, newsletter, looseleaf, and electronic media formats. Lippincott Williams and Wilkins: 10% Off All Nursing and Nursing School Products With Code. Lippincott Williams and Wilkins: Back-to-School Sale! Get 20% Off Sitewide on all books & select journal for fall semester. Ends 8/25/15. Lippincott Williams and Wilkins: Save 40% on The Nurse Practitioner book By Jamesetta A. Newland RN. Expires on 11/08/2015. Lippincott Williams and Wilkins: Special Halloween Sale! Get 20% off Skeletons and other anatomy products + Free shipping on all orders. Limited time only. Free ground shipping is valid for non-subscription orders only in the continental U.S. and Canada. 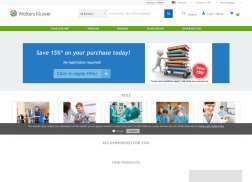 Lippincott Williams and Wilkins: Get 20% off and Free shipping for my DePaul nursing texts. Lippincott Williams and Wilkins: Get 25% off during National Nurses Week. Discount is valid for individual orders only. Lippincott Williams and Wilkins: Holiday Sale! Get 25% Off Sitewide. Expires on 12/15/2015. Lippincott Williams and Wilkins: Inventory Reduction Sale! Get 20% Off Sitewide. Expires on 10/28/2015. Lippincott Williams and Wilkins: Happy St. Patrick’s Day! Get 20% off Nurse Practitioner: The American Journal of Primary Healthcare Book. Lippincott Williams and Wilkins: Pre-Holiday Sale! Get 25% Off Sitewide. Expires on 11/30/2015.